In our WFTDA Wrong-Way Worries article, which brought to attention the potential and actual dangers that clockwise skating adds to WFTDA roller derby, we cited data referencing how the average number of penalties committed during the 2014 Division 1 WFTDA playoff season was up over the same period in 2013. These increases included many penalties that are meant to discourage dangerous play, such as direction of play, forearms, back blocks, and high blocks. They come with a provisional asterisk, however. 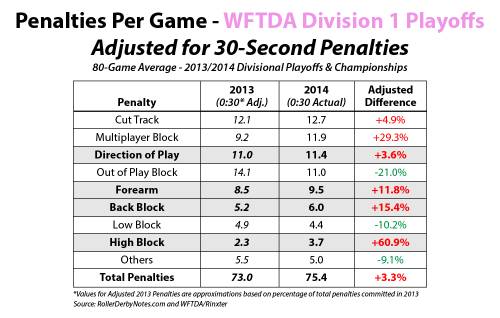 When the WFTDA moved to reduce penalty time from 1 minute in 2013 to 30 seconds in 2014, that introduced a new variable to year-to-year comparisons. A few comments posted to the article, such as the one below, pointed it out. Was the significant decrease in penalty time served, and corresponding increase in playing time on the track, enough to make up for the moderate increase in penalties committed and trips to the penalty box? 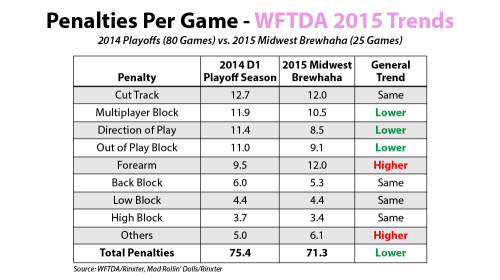 After finding this out and comparing the data for the last two years, we’ll also take a quick look at what the potential penalty trends are for the 2015 WFTDA playoff season. First things first, let’s lay down the hard numbers we’re working with. All the relevant stats referenced here are taken from the (at-the-time1) publicly-available Rinxter data repository. The numbers were then compiled and organized by Roller Derby Notes, producing insights that are not otherwise available. For example, here’s a chart you’re not going to see anywhere else. It shows the average number of penalties committed per game (both teams combined) during the entirety of the 2013 and 2014 Division 1 playoff seasons, with a breakdown for each of the 16 WFTDA penalty categories. The eight most-frequently committed penalties are also shown with their change from the previous year. Red numbers mean penalties went up, and that red +12.9% at the bottom of the chart means they went up significantly overall. This is even more apparent in the individual categories. Look at how big of a jump there was in multiplayer blocks (+41.0%)! High blocks also spiked, even if that only meant another 1.6 a game over the previous year. Still, that seemingly small amount added up to 128 more opportunities for potential black eyes or broken noses over the course of the 80-game season. However, the challenge to this data isn’t the fact that the number of penalties increased. Of course they did, which was obvious to anyone watching the playoffs last year. Instead, we’re looking to determine whether or not the rate of penalties increased. If a skater spent more time playing before getting a penalty in 2014 compared to 2013, that means they were committing penalties less often. If this were the case, any increase in actual penalties taken could be attributed to shorter penalties causing more on-track time, which would then create more time to get penalties at the same rate. We know the frequency and length of penalties, so all we need to do is subtract the amount of penalty time served from the total game time elapsed. Dividing the time that remains (the actual skating time) by the number of penalties will give us the rate at which they were committed. There is something else to consider. 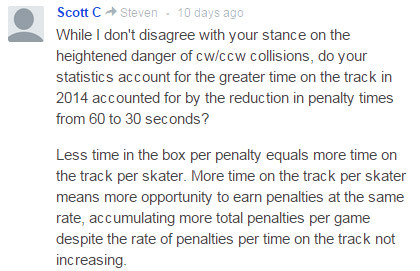 We can’t compare clean-skating time against penalty-box time when neither of those events are being timed, so we must factor out jam reset time from the calculation. The dead time between jams makes the absolute length of a penalty irrelevant; it’s only a factor when a jam is on. Rinxter did not record jam lengths or average jam time in its database, so we don’t know the exact amount of live gameplay. Thankfully, we can easily approximate how much time was spent on jams based on the number of jams played in an average game. In 2013, Division 1 playoff games saw an average of 43.56 jams. In 2014, that number dipped slightly, to 43.48 jams per game. For our purposes that’s close enough to be equal. To help the analysis along, we will simplify to 44 jams per average game. This is a very convenient number for what we’re trying to approximate. If there are two periods of 22 jams each, there are 21 jam resets in each period for 42 total resets. Each reset takes 30 seconds off the game clock. If that 30 second countdown happens about 42 times a bout, then jam reset time takes an average of 21 minutes out of a 60-minute regulation game. Meaning any one skater skating in every jam of an average WFTDA playoff game in 2013 and 2014 would be expected to see approximately 39 minutes of real play time. This is time must have been spent either on the track or in the penalty box, remember. These penalties must have been committed, served, and completed during the 39 minutes the jam clock was running. Simple division tells us the rate at which these codependent events happened within this time frame. Now we need to account for the different lengths of penalties in each season,4 allowing us to see a like-to-like comparison of the rate of penalties between 2013 and 2014. In separating out the PIMs (penalties in minutes), we are left with the time skaters were doing their jobs properly. Oh dear! It turns out that penalties were indeed happening at a faster rate during the playoffs last year versus two years ago. According to these approximations, an on-track skater committed a penalty every 4m50s of jam time in 2013, and every 4m40s of jam time in 2014. For a fan in the stands, that’s the difference between hearing a penalty whistle every 28 jam-seconds in 2013 and every 29 jam-seconds in 2014.5 That’s not a big difference, but it adds up over a game, through a tournament, and a across hundreds of events across the entire calendar year. If we reverse the calculations, we can see what the average penalties per game would have been in 2013, had 30 second (0.50 PIM) penalties been in place and the penalty rate stayed the same. This will give us the the 1-to-1 penalty comparison we were after. If skaters committed penalties with the same frequency as they did in 2013, we would have expected to see 73.0 penalties per game in 2014. The 75.4 per game that WFTDA skaters committed indicates their overall performance, in regards to skating more cleanly, was slightly worse than the year before. Even if the”true” penalty increase from 2013 to 2014 is a scant 3.3%, the differences in how those penalties are happening are more important in this case. Check out what happens when we apply the adjustment made to the 2013 penalty count to the individual penalty categories and then compare them to the 2014 breakdown. The modest increase in penalty rate last year masked the still-significant increases in the types of penalties that the WFTDA uses as its first line of defense to deter dangerous play. The decrease in low blocks is positive, but a big negative is that forearms, back blocks, and high blocks are up a collective 20%. That’s a trend that needs to be reversed post-haste in 2015. The good news is early indications this year are signalling that is happening—with one re-goddamn-diculous exception. In many games at many events during the 2015 WFTDA regular season, forearm penalties have become the whistle du jour. Their increased frequency has been obvious to skaters and fans. Thanks to statistics, we can get an idea of just how obvious they have been getting. This year’s Midwest Brewhaha in Milwaukee was using Rinxter to track and record bout statistics. The full database is here, but we’re only interested in the penalty stats from the 25 WFTDA sanctioned games that happened during the event. 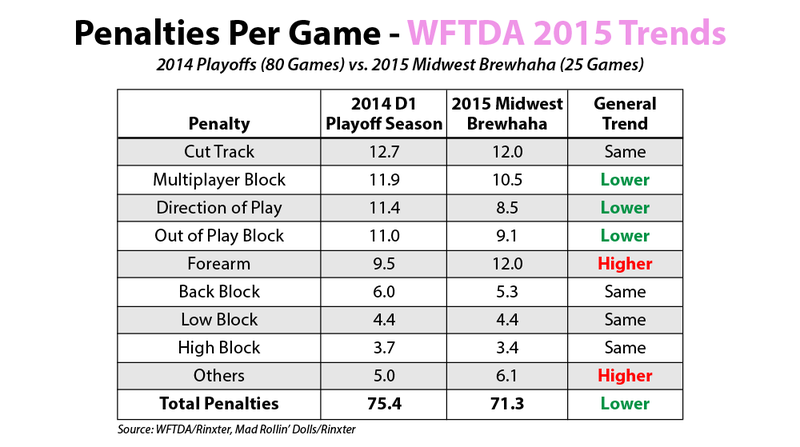 Let’s look how those penalties stack up to those from the 2014 WFTDA Division 1 playoff season. This isn’t meant to be a comparison of significant value due to the mixed quality of participating teams and smaller sample size at Brewhaha, but we can still see some trends. It’s always a good sign when fouls are being committed less often. At Brewhaha, at least compared to the playoffs last year, that’s what is happening. Most penalties are being committed slightly or significantly less frequently than what we’ve been used to seeing. But look at those forearms! That’s an increase significant enough to make you wonder if this is something that will adversely affect gameplay when the best teams in the land engage in some playoff derby. Further staticulation of high-end WFTDA games played in 2015 appears to further the merits of this hypothesis. Last weekend at Pac Destruction in Los Angeles, Angel City hosted Texas, London, and Rocky Mountain for a slate of sanctioned games. With all four teams in the current WFTDA top 12, it was as close as we’re going to get to a sampling of the kind of derby that may go down at WFTDA Championships in Minnesota later this year. Roller Derby Notes was in the house for the three games on Sunday.6 We noted the number and types of penalties being called in each of them. You might notice a trend. This game had at least7 15 forearm penalties. The Texas/London game had 13; Rocky Mountain got 13 by themselves against London. That’s a re-goddamn-diculous amount of forearm calls, a significant increase from the average number in 2014 (itself a significant increase from 2013). What is going on here? Skaters are obviously committing these penalties. That many referees across that many games aren’t all whistling phantom fouls. But why so many of them? Most likely, refs and skaters alike may still be adjusting to the change the WFTDA made in the rules this year to the new/different impact definition of forearm calls. In our 2015 WFTDA rules analysis, we brought to attention the high level of ambiguity in this area. That seems to be playing out on the track so far. There are still a few months between now and the playoffs, leaving plenty of time for the WFTDA to issue any necessary clarifications. If that happens and the number of unnecessary forearm penalty calls drops in line with the other penalty trends (or teams clean up their act) we may see the first real progress in skater penalties in the WFTDA since we started keeping track of it in 2011. However, until we can get through the four Division 1 playoff tournaments and WFTDA Championships, we won’t have a definitive answer on the matter. For all we know, sloppier play may creep back into the game when everything is on the line. Come this December, we’ll have two full years’ worth of 30-second penalty data to compare. Which trends will hold true? As of the posting of this article, the WFTDA has taken down the Rinxter stats repository. A WFTDA-hosted repo is in the works, which will presumably debut in time for the playoffs. You can get penalties from the penalty box, yes. But this happens infrequently enough to not be a significant factor in this calculation. Even if it was, that extra penalty time still only gets counted during a jam, no different than if that skater exited the box and then instantaneously returned to it. Any mention of the term “skater” from this point forward is referencing one of the 10 skater positions that perpetually exist on the track at all times, not one individual skater on a team roster of 14. We’re ignoring the fact that jammer penalties can be cut short via jammer penalty swaps/musical chairs. It won’t matter so much given the final result, but it should be noted that this probably disadvantages 2013, seeing as jammer penalty time was much more likely to be cut short (and clean skating time increased) by jammer swaps than in 2014 due to the longer penalties. Which is way too often in either case. We ticked off all penalties that happened, but not all of them were made clear as to the type of call. About 8 per game went uncategorized by our unofficial count.